Yesterday I spent a few hours at the new Telus Spark building. This is the new building that opened in late October 2011 after the formerly named Telus World of Science Centre vacated the former Planetarium. This is certainly not the case any longer. There are a lot of things happening in the area surrounding Telus Spark. One of the big things is a new development called the Brainasium that according to the signage on site, it is scheduled to open in July 2014. As there is only one day left in the month and they are doing active construction, it would seem rather doubtful that this will happen. I guess it will just open when it is done. I was talking to one of the ladies involved with Telus Spark last week while on a lunch break at their display tent along Stephen Avenue Mall where they were helping promote Beakerhead and the Mini Maker Faire. The Brainasium will be a big outdoor park, which will have a giant slide that is under construction right now; and a giant set of ears; and a teeter-totter designed for six, plus more. For anyone visiting with children (or if they are a child at heart) this will be a lot of fun. You can read more about it here. One of the interesting things that I noticed in this space is a brand new sculpture. It is by the four member German artist team (comprised of Hans Hemmert, Axel Lieber, Thomas A. Schmidt and Georg Zey) who operate as an artist group called inges idee. Observant readers may recall that inges idee was inadvertently involved in one of the biggest recent public art controversies in Calgary. 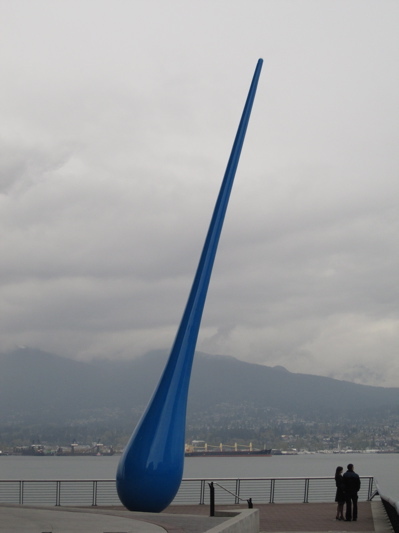 This occurred when their sculpture colloquially known as the Blue Ring, or more formally as Travelling Light, was unveiled in the middle of the most recent civic election last fall. The timing was impeccably unfortunate. Last October, I wrote about this piece and the politics around this work at the time this situation occurred. Personally, I suspect that the Travelling Light piece; and as it was with the previous controversial project Santiago Calatrava’s Peace Bridge over the Bow River; both have (or will) grow(n) on people over time once the immediate politics have diminished over time – which always happens. In that respect both are like the highly controversial Mario H. Armengol [Spanish/British, 1909-1995] group of sculptures entitled Brotherhood of Mankind, circa 1966-67 (or more colloquially the Family of Man) which was removed from the United Kingdom Pavilion at Expo ’67 in Montreal and placed in Calgary shortly thereafter as a gift to the City by a former resident. It is my opinion that people will then be able see the Travelling Light piece for what it is and will become – a circular frame that shows the beauty of the city, along with the landscape and a view of mountains in the distance. Like all art, not all people will appreciate it (just as it is with any other style of work). As my mother would say when I was a child and trying out a new food, “you don’t have to like it, just try it and see whether you do.” But I digress. Back to this new work by inges idee. 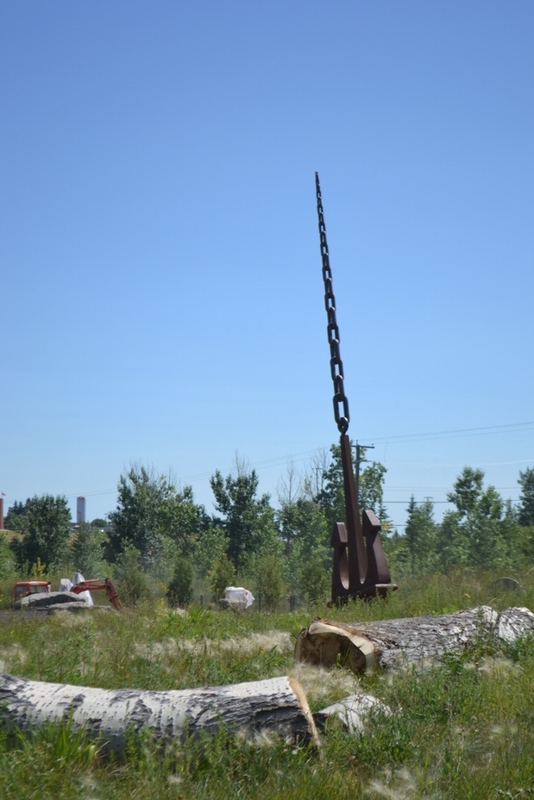 The sculpture that has been installed in the Brainasium at Telus Spark is of a large anchor 25 foot (7 metre) high. It was installed in late 2013, probably shortly after Travelling Light was fully installed. 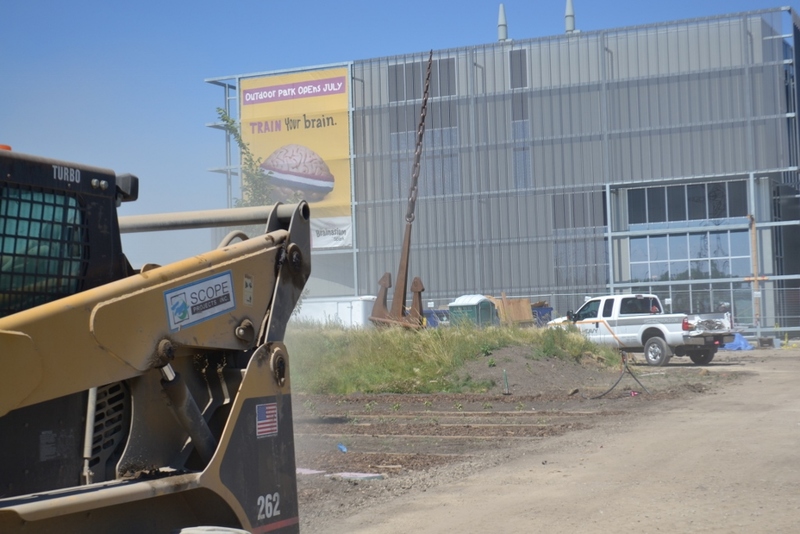 However, with all the construction that is currently happening in the Brainasium area surrounding it, the appearance is that it is newly installed. 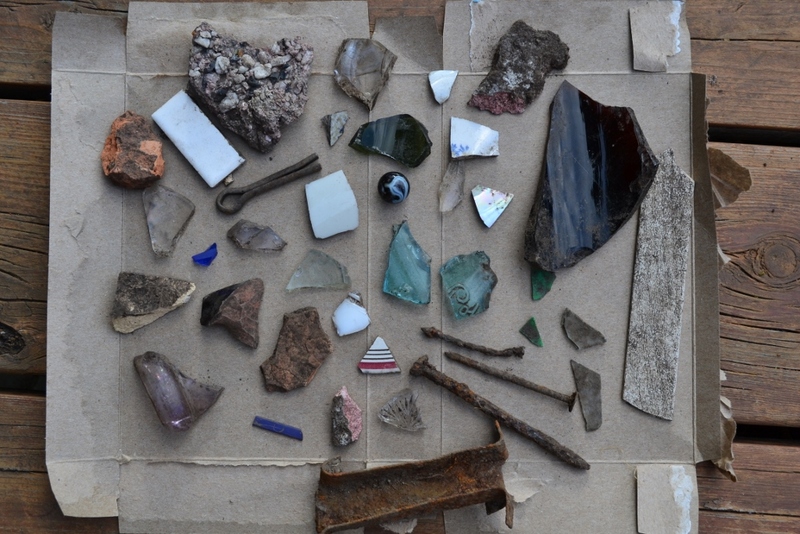 There was very little press about this work – unlike its kin Travelling Light (or the Blue Ring). In fact, Telus Spark did not even issue a press release about it as they did with the Request for Proposals (RFP) in July 2012. I suspect that they will once the first stage of the Brainasium is open. This illustrates how much politics surrounded the other work last October. It also illustrates why the artists from inges idee seemed genuinely surprised at the feedback in the press and popular opinion; and why they took the unusual step to issue a statement in response. Enough of the politics, now let’s get back to talking about the work. The following theme is to be followed in each pitch: a strong and highly visible linking of water as a force, resource, conduit, cycle and medium for expression. The art piece will provoke curiosity, evoke the power of the outdoors and connect people to the environment that TELUS Spark occupies. The Anchor with the attached chain has a definite connection to water. Interestingly the links in the chain get progressively smaller as it gets closer to the top to accentuate the illusion of perspective and fading to infinity. For whatever strange reason, this makes me feel like one of the lobsters beating a clamshell in the song Under the Sea from The Little Mermaid (1989). You’re welcome! As a piece of art in a creative environment it allows for imagination to take hold. As alluded to in my comment about the song Under the Sea, this work illustrates how an anchor is a fixed point of contact to land, while the boat or ship that the chain is connected to is allowed to ebb and flow with the natural rhythm of water. The rusted colour and appearance only further solidify this connection and dialogue. For further discussion ,there are a couple other pieces that create a dialogue with this work. It also creates a strong, dynamic diagonal between the seawall and the overhanging roof of the Convention Centre. The 18-metre-tall sculpture, titled “Infinite Tire”, is a tower made from 18 whitewall tires stacked on top of each other. The tires—created from a fibreglass product specifically for the installation—become progressively smaller in diameter as the tower rises, from 163 centimetres at the bottom to 36 cm at the top. 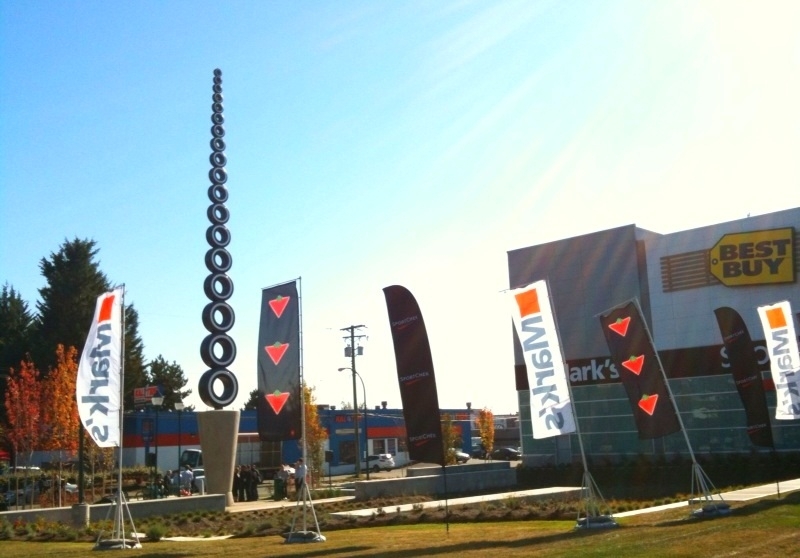 When looking up at the sculpture from near its base, the decreasing size of the tires makes the stack appear to be stretching off toward a distant vanishing point in the sky. All told this Calgary piece seems interesting. I look forward to being able to see it closer than I was able to do yesterday, from the outside of the construction site. I suspect it will be complete sometime during the next month or two. 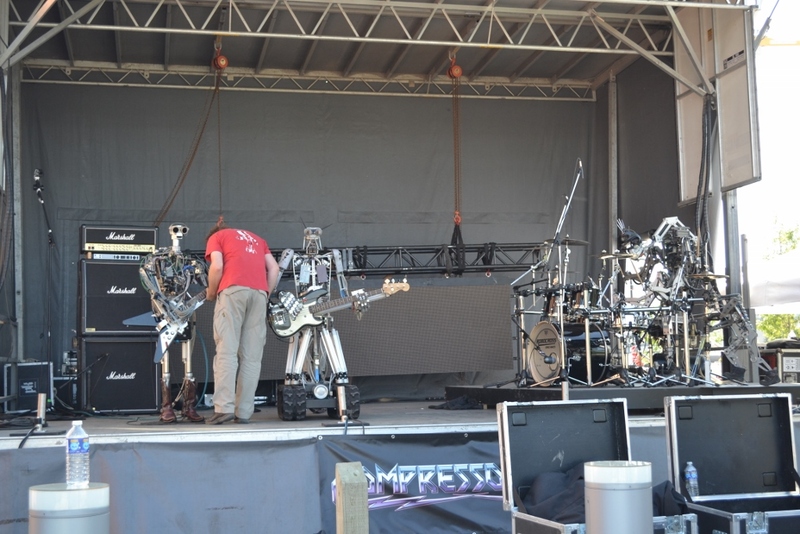 I was out this afternoon as the robots were getting set up for the music concert in East Village. The kids will love it and so will the adults. It all starts at 8pm and will cover the area around Olympic Plaza, East Village, the RiverWalk and Victoria Park. Come for the fun. Stay for the dancing and party!!! It will be a plethora of sensory overload!!! How awesome is that!! And the Catharsis Catapult is happening to see how far you can toss your crap (or your ex’s crap) using a catapult on the grounds of Fort Calgary between 1:00-3:00pm. How much more awesome is when you put it all together!!!! It might almost be as awesome as Nuit Blanche was last year! 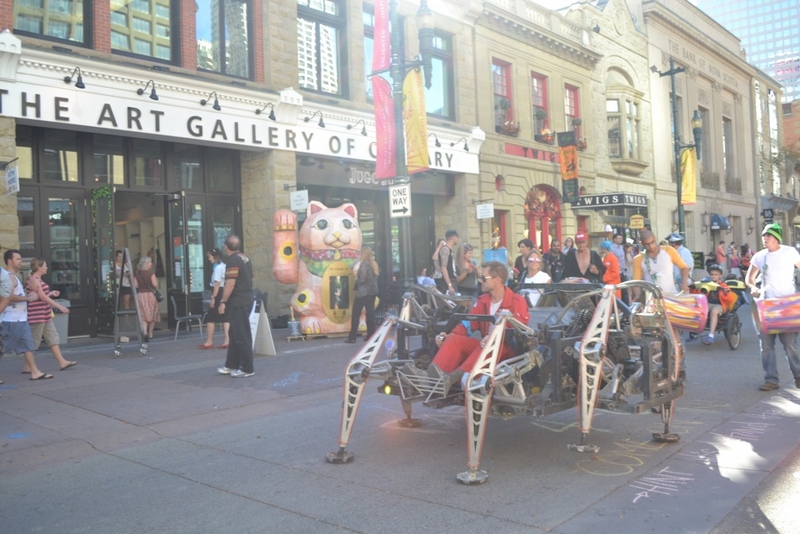 This afternoon as part of Beakerhead there was a bunch of science buskers along Stephen Avenue Mall. It is part of a program called Four to Six, and it will happen tomorrow after the work day between 4:00-6:00pm. Roaming scientists and laboratories – the one hosted by Telus Spark was very interesting and perfect for someone like me that has the attention span of a gnat. I plan to write about it later. It all adds up to an enjoyable way to end the work day. If you have children bring them to work for the afternoon and then spend an hour or so visiting the various activities. Or you if you are interested in someone at the office, invite them to join you after work and make a date ending up at the Art Gallery of Calgary. It all adds up to a fun time where you can learn something new.